Beer Snob about to tuck into some turkey with beer marinade. Craft beer is rarely humble. Bold, complex, sumptuous ales love to show off. Their rocky heads erupt with the aromas of grapefruit and cinnamon and baked bread. Their amber, golden and chocolate brown hues cavort in the waning sunlight. A single sip of an expertly created doppelbock or imperial stout commands your attention. However, as we celebrate abundance while recognizing scarcity this season, beer can play a supporting role. It’s only appropriate as we appreciate the joys of comfort food during a season that’s been anything but comfortable for millions of Americans. I had a chance to try out a turkey marinade that costars beer, which you might want to incorporate into your Thanksgiving meal. I’d like to share it with you, along with some beer recommendations. You just whisk together the oil, beer, and lemon juice before mixing in everything else. I placed the marinade into a plastic baggie, plunked some uncooked turkey thighs into it and let it refrigerate for a few hours before baking them. I found that I could sense the beer, but that it had almost become wine-like in the process. Dark fruit aroma wafted off of the crispy skin and some of the nutty sweetness penetrated its way to the juicy meat. I frankly don’t know how this would work on a large turkey, but I’m fairly confident that on a smaller bird this would do the trick. While you’re stocking up on napkin rings and tureens, consider picking up some of the following beers. I believe that we beer lovers should give thanks to all of our patient bartenders who don’t mind giving shot-glass tastes while they wait for us to make our decisions. Thanks also go out to wait staff who tuck pride away and have no problem reading from the most updated beer list. And finally, thank you to the bloggers and tweeters and Facebook posters who provide free advertising for small breweries in our state. The word’s spreading, and that’s something for which to be grateful. 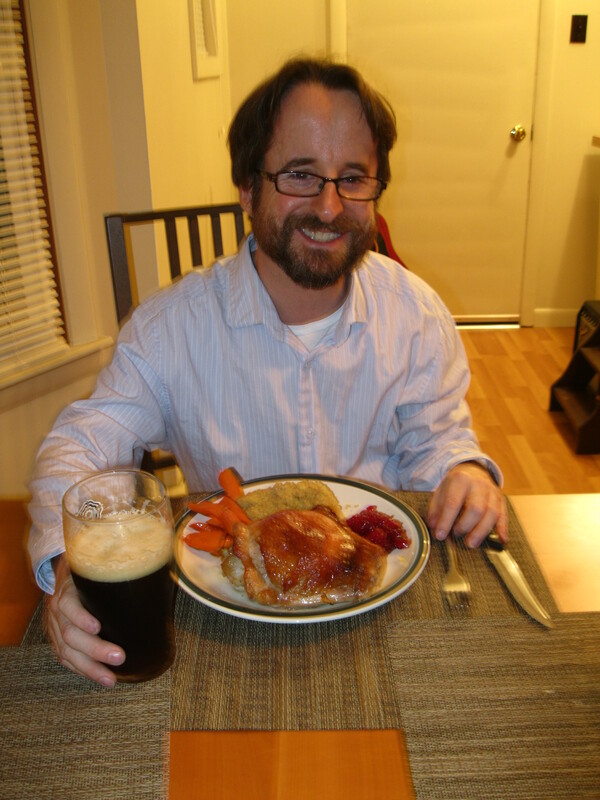 Want to share what you’re thankful for with Beer Snob on Facebook? “Like” him and type all over his wall. You can also follow his heaping servings on Twitter. Look for @BeerSnobCT. This entry was posted in Beer Snob and tagged Clown Shoes, recipe, Stone Brewing, Weyerbacher Brewing. Bookmark the permalink.